Technique of the Week: Blanching | We Like to Cook! This is the first of a new series posts which will feature a different cooking technique each week. We chose blanching because we seem to be doing quite a bit of it lately with the gorgeous greens that are coming into season. I recently mentioned to a friend that we were having our favorite Swiss chard gratin for dinner. When she politely asked how to make it, I started the explanation with "first you clean the chard and blanch it." Her eyes immediately glazed over and she said, "I'll never make it - I don't even know what blanching is." 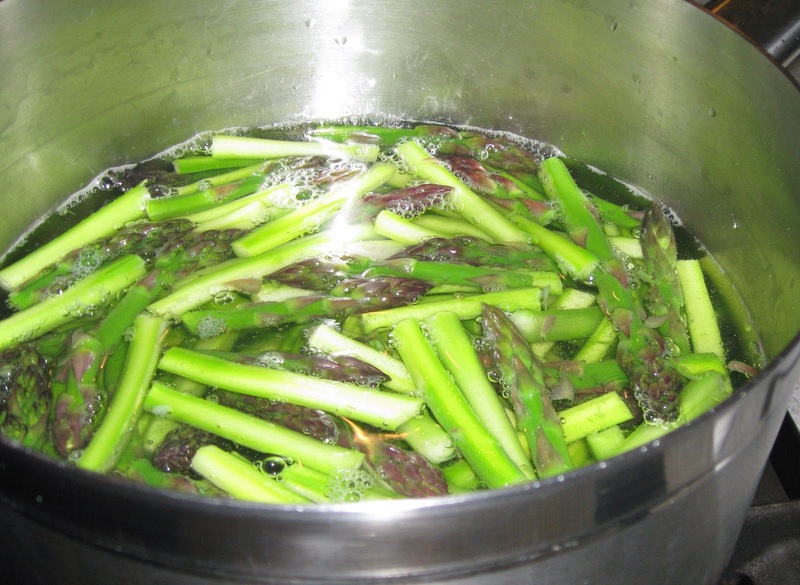 Blanching is the process of plunging raw food items into boiling water for a few minutes typically to soften, partly cook, or to remove a strong flavor. After a brief time in the boiling water, the food is then plunged into cold or iced water (shocked) to immediately stop the cooking process. The term blanch used to mean "to whiten" and was used to whiten meats like veal. Today this method is more often used to remove the skins from certain fruits and nuts including tomatoes, peaches, pistachios and almonds or to destroy enzymes that will spoil the flavor and texture of vegetables when frozen. Blanching cleanses the surface of dirt and organisms, preserves the color and retards the loss of vitamins of vegetables, especially leafy greens such as broccoli rabe or kale. In the case of asparagus, the technique of blanching is actually the preferred method of cooking the tender-stalked perennial. To cook asparagus using the blanching method, the shoots are boiled for 30 seconds, and then to stop the cooking instantly they are dipped into cold or ice water. To pasteurize large eggs, place them (whole-still in the shell) in a saucepan filled with water and fitted with a digital thermometer. Turn on the heat and bring the water temperature up to 140 degrees F and cook eggs for 3 minutes. Remove eggs from hot water and rinse thoroughly with cold water to stop the cooking process. Pasteurized eggs will keep in the fridge the same length of time as unpasteurized eggs and can be used just as any raw egg would be used. We mark the shells with a Sharpie marker to make them easy to identify.